Schematic figure of the considered arrangement. A gas hydrate surface (ε3) on the left, separated by an ice layer (ε2) of thickness d from a water layer (ε1). 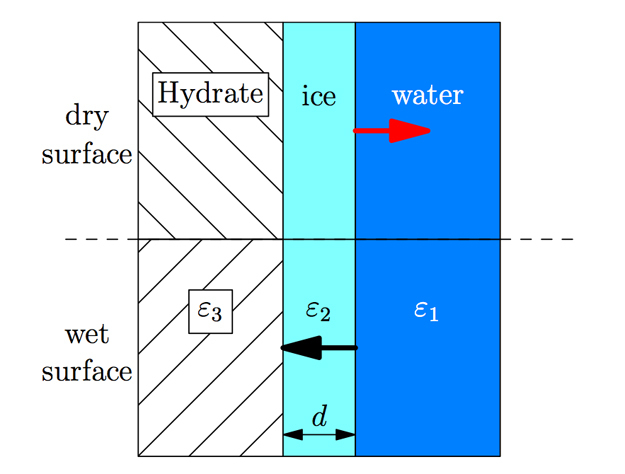 A dry surface feels a repulsive Casimir force at the ice-water interface which yields a stable ice interface. In contrast, an attractive force results in a wet surface due to the vanishing of the ice interface. CO2-hydrates likely drive the massive gas-rich water plumes seen and sampled by the spacecraft Cassini, and the source of these hydrates is thought to be due to buoyant gas hydrate particles. Dispersion forces cause gas hydrates to be coated in a 3-4 nm thick film of ice, or to contact water directly, depending on which gas they contain. These films are shown to significantly alter the properties of the gas hydrate clusters, for example, whether they float or sink. It is also expected to influence gas hydrate growth and gas leakage.